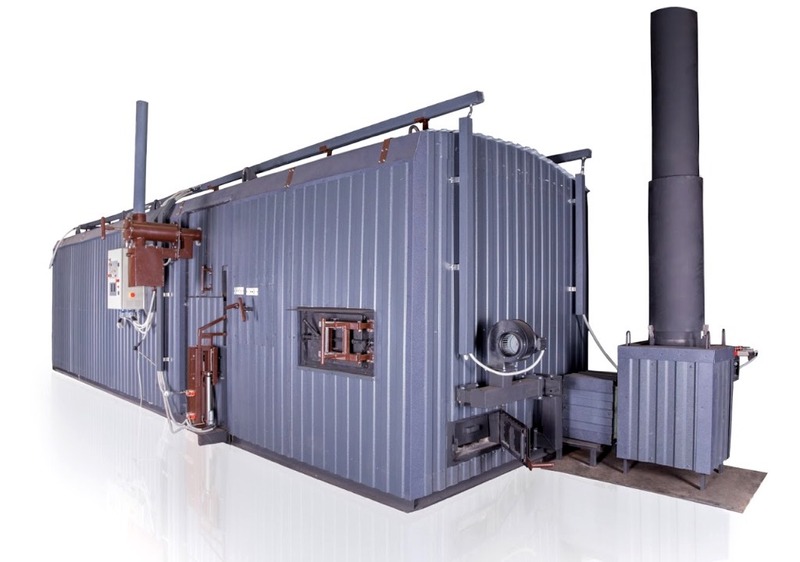 BIO-KILN is designed for processing of different types of carbonaceous materials of plant origin with the size of the fraction - 10-40 mm, for example: wood chips, coconut shell and other nuts. 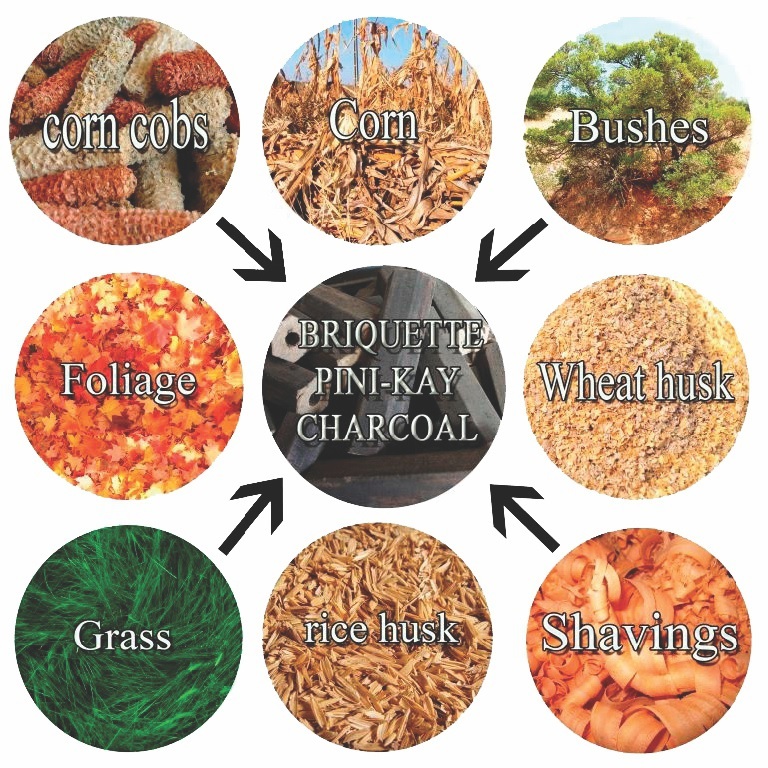 Obtained products: BIOCHAR, charcoal and heat energy, if necessary it is possible to separate liquid products of pyrolysis. High quantitative and qualitative indexes of charcoal. This installation is a continuously operating kiln for the processing of organic raw materials in bulk form. View of the kiln is shown in figures 1 and 2. 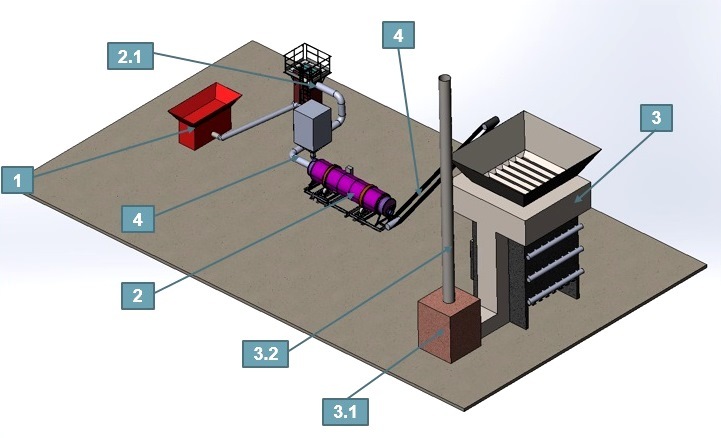 The raw materials, crushed and pre-dried in a drum dryer, are fed by conveyor into the hopper (pos. 1), located in the upper part of the kiln. 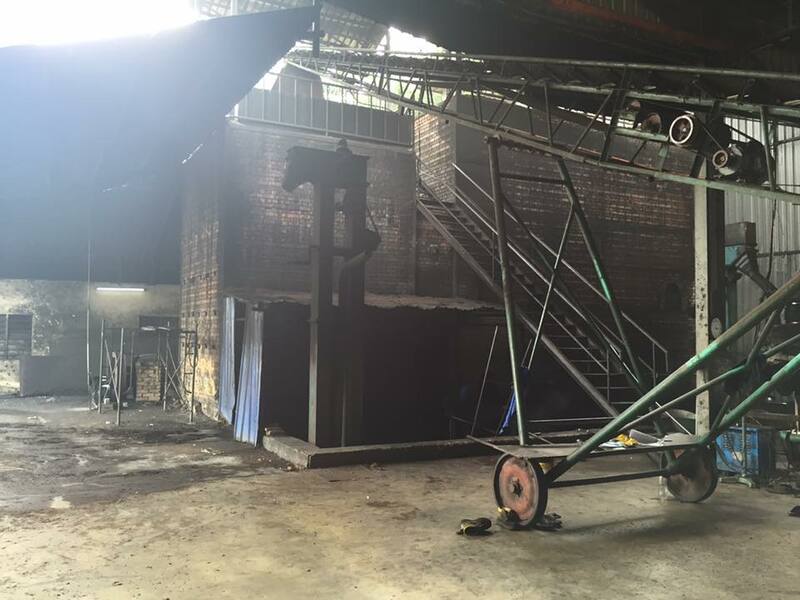 The active zone of the kiln is a vertical drop channels, ending with dampers for unloading of the finished product. 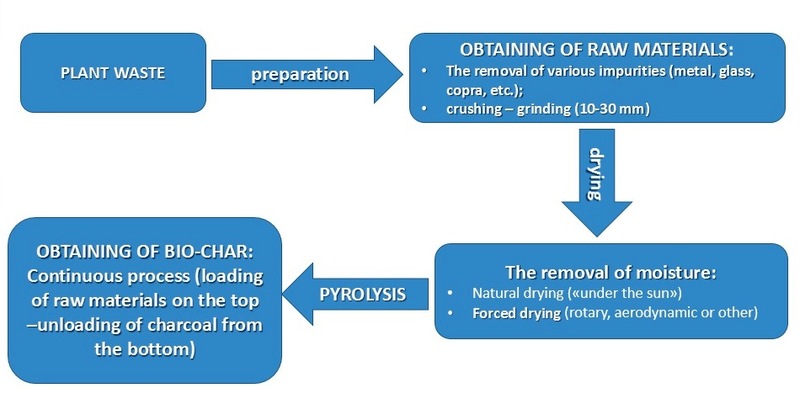 Raw materials fall down through the channels (pos.2) in accordance with the stages of the process: pre-drying, pyrolysis (charcoal formation), calcination and cooling of charcoal. The active area of the combustion chamber is located between the channels of movement of raw materials. 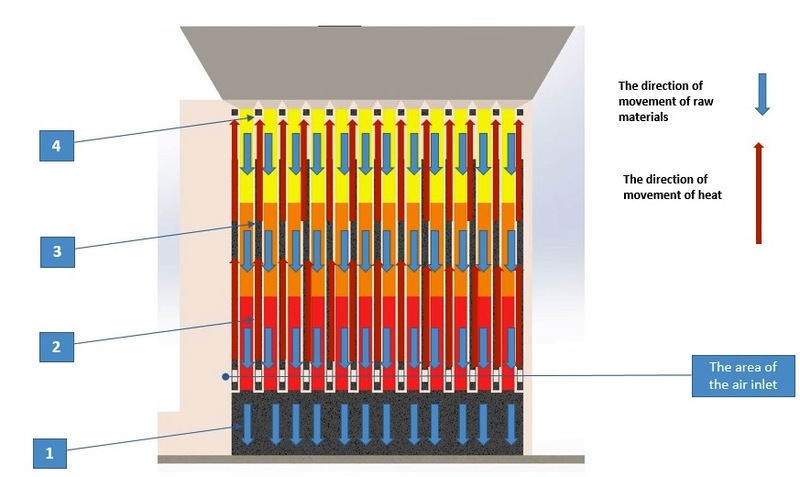 Heating of the raw materials occurs through the wall. 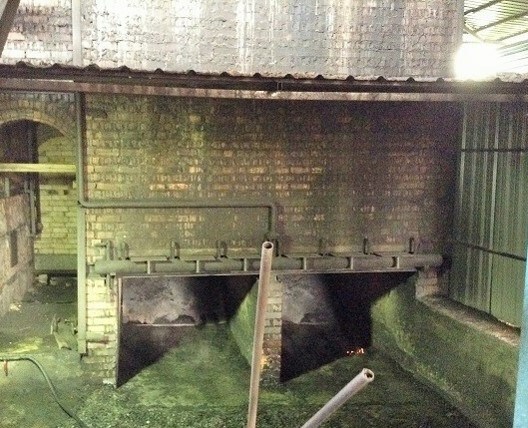 The movement of raw materials and products of combustion in the chambers is oncoming. The active zone of the kiln is designed in such way that several zones are organized over the entire height of the channel of raw materials. The active zone is presented in figure 3. In the active zone there are four zones. The first zone (the numbering of zones goes from the bottom to top in a direction opposite to the movement of heat carrier) - stabilization and cooling of charcoal with a temperature of 300-600 degree, the second - the calcination zone, where the temperature is 450-600 degree (it is highlighted in red in the figure 3); the third zone is the pyrolysis of raw materials - 250-450 degree (it is highlighted in orange in the figure 3); the fourth zone - the zone of pre-drying and beginning of pyrolysis 100-250 degree (it is highlighted in yellow in the figure 3). 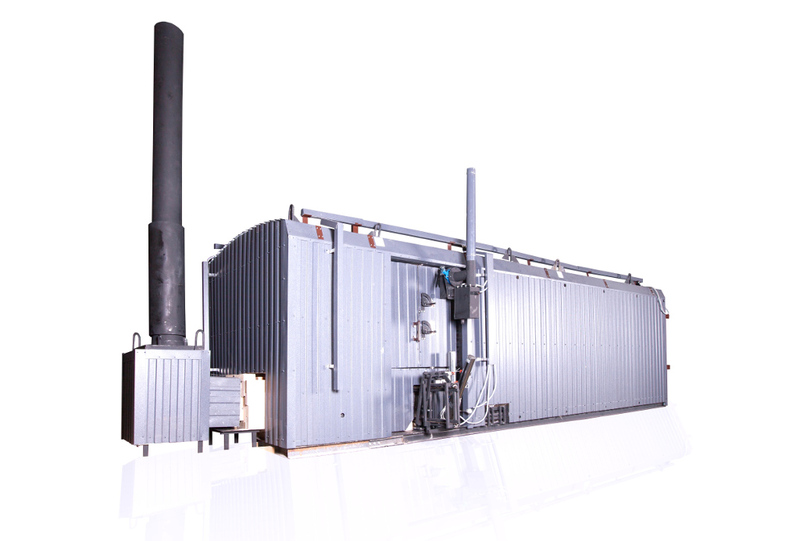 Gas extraction is performed directly from the zone 3 of pyrolysis and supplied into a gas collector (pos. 3), and then it is supplied to the bottom of each combustion chamber. The temperature in the active zone is maintained with a certain amount of air, supplied to the combustion chamber - to the area of each zone of the process. The amount of air is maintained at a level necessary to maintain a certain temperature in each zone. The air is supplied to each zone by air collectors (pos. 4). There are provided three air collectors for each zone. Exhaust gases with unburned gas are supplied into flue gas channel (pos.6) and then into afterburner (pos. 7), where its complete combustion occurs. The design of the afterburner provides absolutely complete combustion, ensuring ecological safety of installation and lack of emissions into the atmosphere. 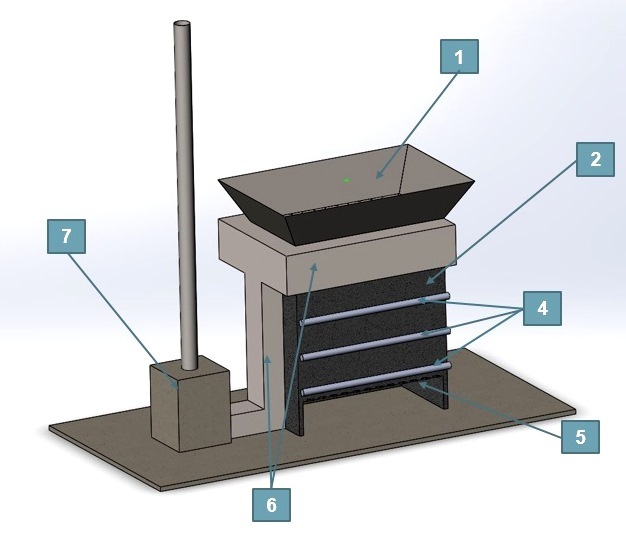 Charcoal unloading is implemented by dampers, located in the lower part of the kiln - in the cooling zone. 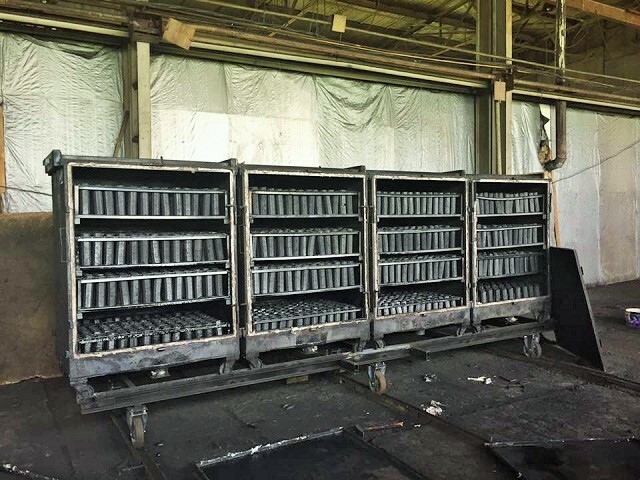 Each channel has several dampers, providing the portion unloading of ready charcoal and preventing strong subsidence of the raw material below the active zone. Crushing installation. It is designed for the initial crushing of raw material to the desired fraction. 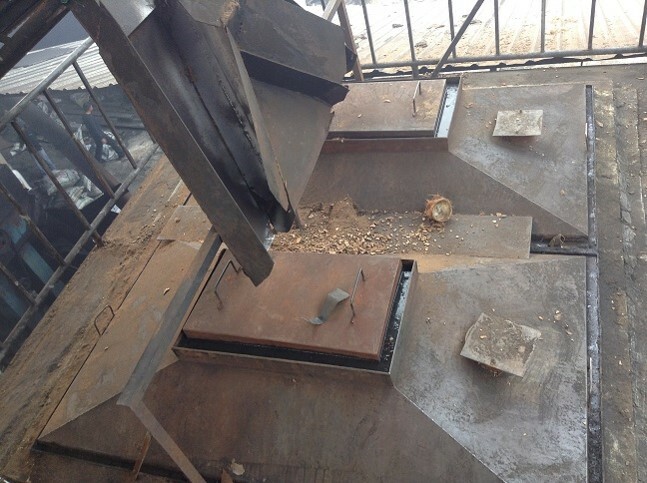 Type of crusher is different depending on the type of raw material. After crushing process, by-products can be extracted from the raw materials, for example, copra is removed during the processing of coconut. Installation for processing - BIO-KILN. It is designed for direct control of the process includes afterburner (3.1) and chimney pipe. (3.2). 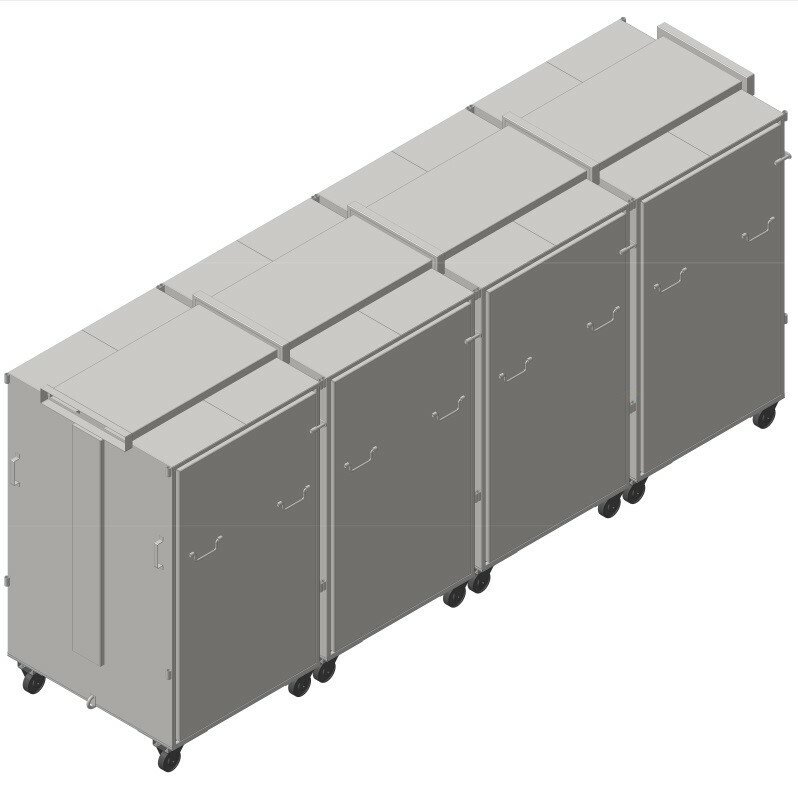 A set of conveyors and the intermediate hoppers, which ensures the operability of the whole complex in order to supply and store raw materials.